Guild Wars 2 may not completely revolutionize the genre, but it certainly appears to be the new standard that future MMOs will look to. Was I the only person who saw the ending cut scene and thought: "Knockdown, dodge the rock throw because it does half your health, fear"
Oh thank the gods, finally. Someone who stops using that damn word while reviewing GW2. "Revolution". Ugh. I hate that Guild Wars 2 keeps advertising itself like that, especially because (as someone who has played the game for hours and LOVES it) I can honestly say it's NOT a revolution, it's an evolution. It takes most of the concepts present in other MMOs and refines them and/or makes them work better than they used to. The leveling curve and "grind"? A flatter leveling curve and more methods of gaining experience make leveling faster and easier than in most MMOs. Plus, as you point out, the death of "kill tagging" and "kill stealing", in addition to additional behind-the-scenes mechanics that provide players with bonus experience for things like killing mobs with other allied players or reviving your allies/party members, leads to players actively cooperating with each other for the benefit of everyone. Quest mechanics? Instead of gathering a list of things to kill and items to collect, you're given two types of "questing": 1) Hearts, which provide an individual questing experience that gives you multiple methods of completing the quest satisfactorily; or 2) Dynamic events, where you're given a group progress meter and everyone has to work together to achieve certain tasks within the confines of the quest, and everyone receives rewards based on their level of contribution. In both cases, the questing feels more life-like because it does away with much of the flavor text, replacing it with actions and events that spawn seemingly out of nowhere that make the world feel alive. But perhaps the best part is that unlike typical quests, you can repeat group events on a fairly regular basis ("farming" them if you so choose), allowing you to keep playing events that you enjoy rather than just completing a quest, turning it in, and moving on. Skills? Instead of a massive bar full of skills, the game restricts you to five primary combat skills (based on your weapon), a healing skill, three utilities, and an elite (which functions as a more powerful and rarely-used utility). The combat relies far more on a player getting to know the intricacies of their weapons and using them smartly. Something I enjoyed was that I figured out ways to mix my Ranger's longbow with other utility skills to create massively powerful combos that can absolutely crush enemy monsters. That sort of design allows skillful players to really excel, killing things they may not otherwise be able to beat, which is something I truly appreciate. Really, the game does a lot of things much better than I've seen them in other games, and is worthy of every high rating it gets. * The episodic design of the Personal Story leads to many seemingly important plot revelations being dropped or forgotten. * The dye system is character-locked, such that dyes must be unlocked individually on each character (which is STUPID). * The jumping mechanic and significant emphasis on jumping puzzles is downright frustrating, since different races and sizes of character will be perceived as jumping differently, causing players to fall to their deaths on many occasions for a jump they should have made. It doesn't help that the jumping mechanic itself feels somewhat unreliable to boot, as you'll have to push the jump key and forward key in slightly different ways to achieve completely different jumping heights and distances. And there are others, of course. But even with all of the flaws, the game delivers such a fresh experience that I can't bring myself to hate on it. It takes so many frustrations from other MMOs, things that normally end up convincing me to stop playing those games....and it makes them fun and enjoyable. That alone is worthy of praise: taking things that most people find boring and reducing or even removing the mundane nature from them. All told, the best MMO I've ever played. And I'll be playing it for a long time. 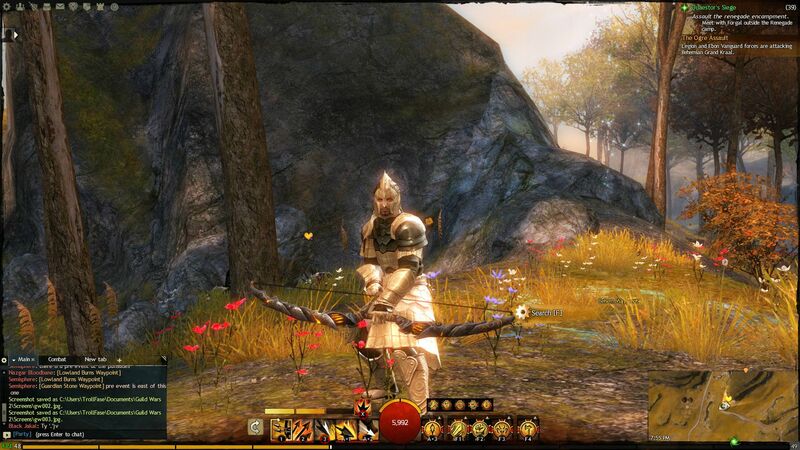 EDIT: Oh, and Guild Wars 2's charr race has created arguably the best holiday ever. Meatoberfest. I want to celebrate that holiday in real life. Just gather a bunch of friends together to drink alcohol and eat meat-on-a-stick. That's how the charr roll, baby. What, you think that's dumb? You wanna fight about it? Back off, meat. and not to mention, gone are the days of monthly subscription fees. It's a damn decent game, fo sho. Now, RELEASE THE GW2 CLONES!!! I had to upgrade from an Nvidia GTS250 to a GTX570. Even though their performance chart put the 250 in "high" range, even on "best performance" I barely reached 20 FPS. Now, even in scenic and intensive locations I have a steady 45+ FPS. Wow, watching how the combat works reminded me a lot of The Secret World (my current MMO love), but with even more movement than TSW. I definitely need to get this game ASAP. I would call the no-subscription aspect pretty damn revolutionary, because then you can simply treat it as a $60 multiplayer game with HUNDREDS of hours of content. I take it this is the final review? Either way, it make me wonder who will be the first company bold enough to make an MMO using similar mechanics to GW2? Agreed with everything but this. I loved the jumping Vista's, especially some of the hidden puzzles (like the hidden pirate cave in Lions Arch). I thought a lot of them were really quite clever, with some of the puzzles being massive in scope and easily the equal to several levels of a traditional platformer, taking 10-15 minutes to complete. The inclusion of Vista's and puzzles into GW2 was one of my favorite features. My favorite feature though, was the gigantic, multiple chain Dynamic Events leading you through giant battles, sieges and ending with a massive world boss fight (some of which being surprisingly challenging not to die on). I was absolutely blown away by the Harathi Hinterlands for example, some of the most epic things I've ever seen in gaming period. Literally thousands of people working together to take down a massive Centaur stronghold, along with the Giant world boss (that has an attack that will two shot everyone in the raid group every few seconds unless you time your roll correctly). I'm not a huge MMO player however I picked this up since I played a bit in the original game. Overall I've been very impressed with the sense of polish on the game and the fact that there are no silly monthly fees with this (same as GW1). The only thing I'm constantly forcing myself to remember whenever I manage to crawl up to a vista .... you can't jump off the damn thing like in Assassins Creed and hop into a haystack. Can you really call it revolutionary if Guild Wars (1) has been doing it for seven years already? It's a Guild Wars game, what does it matter? The first was hardly a huge success. Wait... 6.5 million copies sold for GW1 is not a huge success..? what? The temptation...so high. The nice ones are the ones with water below, so you can kind of do that. Am I the only one who hasn't had major fps issues? I don't have a particularly good computer but I've got most settings to maximum with shadows toned down and the only (very occasional) problems I've had have been largely temporary (i.e. performance is dragging but there's nothing major on the screen, which usually goes away within the hour) with no problems at all in big WvW fights or group boss events. All in all, an excellent game. There's enough for old fans and new to enjoy, and we can expect a lot more development. Justin barely touched on many of the gameplay features that make working together such a treat (resurrections, combo fields etc) but what I'd really emphasise on top of that is the beauty of the world; the sound direction, art direction and environmental effects work an absolute treat to make the experience a memorable one, with all the visas, skill points and points of interest there to force the true scope and depth of their hard work into your face. Great even review! I love this game to death, but I swear one more "it's revolutionary" and I will break someone's neck. I've been looking forward to this game for 5 years now and it sure hasn't failed to impress me. The art, the sound, the lore, I love every bit of this game. Why did the review not mention how awful WvWvW is? It's a complete zergfest, you can't see the enemy teams' names or color customization, and they can't see yours. It turns in to two groups running in to each other with large numbers, spamming aoe abilities. I had occasional FPS issues in Nolan Northville but haven't had an issue since starting up a Silvari Engi. No doubt my issues are entirely related to playing on North American servers from Australia. In a month or two I'll drop some money in the store if I'm still playing, I'll probably be wanting a new char slot by then. Guild Wars 2 is Vanilla. It's has got to be one of the most overhyped piles of meh. I've ever had the misfortune to spend $60.00 on in a long time. It's not horrible, but the storyline, combat system, voice acting, skill sets, etc are average, predictable and safe. There is nothing very memorable about the game, it kills time as this "Amusement game" is designed to do. You'll go from one main event to the next, but you'd be hard pressed to remember many of them along the way. So if your looking for a game that is like a comfortable pair of shoes, then GW2 is for you. If you want movement, I would reccomend an assassin, half of their attacks/skills include some kind of leap, blink or vanish. Quite annoying to fight in places where you risk falling but a lot of fun otherwise. Elementalist & mesmers also have some decent mobility & deceit, but nowhere close. And yeah, it has a lot more movement than TSW. Just be warned that the "serious skill" endgame has more in common with DotA than with WoW, in that it revolves around getting a good solid PvP team and running battlegrounds. And if what the devs have said turns to be true, they will do their best to turn those battlegrounds into a full fledged e-sport. Shame you have that opinion. Personally, some of the design and story choices (my favourite being the fact that Sylvari have no concept of the difference between homo and heterosexuality, a fact that becomes abundantly clear in an early story mission of mine where I saved the love of a young Sylvari, as makes sense for a race of plants who all grow from the one tree to whom genders are really just aesthetics) took me by surprise. Oh, and the Straits of Devastation. That place is amazing. Fighting alongside a guild to help establish a beachhead and hold it against the undead, backed by submarines unloading waves of Pact soldiers, felt like some kind of epic fantasy D-Day and sends shivers down my spine every time I remember it. All of the areas in the game have some kind of awe-inspiring sight, but the Straits of Devastation have them everywhere. Dogfights in the sky between airships and dragons, the cannons of Fort Trinity, the hilarious Jaws moment when I was on the surface trying to heal after being downed in a fight against the Risen Megalodon only to be snapped up in bite a few seconds later. The opening areas in the game (Sylvari sexuality not-withstanding) to run towards the boring a bit more often than not, which is a shame. However, the game becomes steadily more complex with the unfolding event chains and by the time you reach Orr, the stuff going on is just staggering. The Straits of Devastation are now the source of some of my favourite moments in gaming. Seriously, i always forget they renamed the class. Not enough "farm" and "grind" words in review. Sure - leveling up was relatively fun. Theres a lot of dynamic events going in every zone (unless they are broken) but when it comes to "endgame" part... you either have to farm same instances over and over again for tokens or focus on completing the world map which means killing a lot of same mobs, doing a lot of similar renown hearts and encountering a lot of broken skill points and events. Theres literally nothing to do on higher levels. Nothing that would include "fun" at least. Except for WvWvW and puzzles. Main quest was boring as hell. Rewards were pathetic and useless, in fact - developers already had to promise to change them. Economy is broken - trader is flooded with a lot of... everything. Recent mystic forge item dump didn't do anything at all and prices are back to vendor rate yet again. The game excels only at eliminating the "grind" aspect of the mmo's during leveling but completely botches everything else. Quests, rewards, sense of accomplishment, economy... and don't even get me started on the last boss of main quest, thats gotta be the first time ever in history of the games when you had to click the passive mob to its death to finish supposedly epic battle for survival of all races. The game excels only at eliminating the "grind" aspect of the mmo's during leveling but completely botches everything else. For me this game is the spiritual successor of DaoC, as such I came for the WvW and to a lesser degree for the structured PvP (aka battlegrounds). The PvE? Yeah, kind of reminds me of the old GW 1 grind, painful at the beggining but if you submit your soul to that torture long enough becomes kind of familiar and even comfortable. It actually looks good, and its combat looks incredibly similar to Xenoblade. I would like the puzzles more if they didn't rely on jumping mechanics that aren't entirely reliable. I've extensively tested jumping and it turns out that, depending on the order of your key presses and the timing between forward key and jump key, you achieve totally different styles of jumping. Add to this the fact that different races have different jump animations, leading to differences in the height/distance perceived by the naked eye, and you have to be pretty experienced with jumps (or take your time on every single jump) to nail these puzzles. And several puzzles don't give you the time to size up each jump, making them often quite deadly. I honestly am really disappointed in this part of the game and it kills me that they couldn't find a better way to implement it. I'm glad that you agree with most of my criticisms though. I do see a lot of DUMB criticisms leveled against the game, though, like "dungeons are too hard" (which is the whole point, lern2play seriously >_>) and such. I don't mind if people have good criticisms to level against the game, but the number of really stupid criticisms I see from some people is just amazingly vexing. Especially since most of them boil down to said person being terrible at the game, nothing more or less. The dynamic events are really what sells this game. Despite all of its major flaws, the simple fact that I can accidentally stumble upon a major event like that is really the sort of MMO experience I want to see more often. I am really happy I purchased the Guild Wars 2 Collector's Edition. It is an excellent MMO that I am really enjoying. Well, it's the difference between a running jump and a standing jump. Pretty standard learning curve if you're experienced with platformers. Though, for people who don't platform much, man ... I get how it could be horrible. I've played every race, and sure, the animations can be deceptive, but every character's collision box does move exactly the same way. I had guessed during the betas that Asura would be overpowered, simply due to you, the player, having better vision. Turns out I was mostly right. Stupid human overpowered racial elite. For some of the more challenging jumping puzzles, I'd recommend finding a source (preferably multiple sources) of swiftness. Running jumps are modified by movement speed, which means you're going to clear 33% more distance with swiftness on, vs. no speed buffs at all. Grouping with a mesmer (who's good at jumping) also breaks the game. "just beam me up, kthx"
It's probably the main reason my mesmer is still level 2, whilst my 7 other characters are mid to max level. I have no interest in being bugged to be a puzzle-aid. I've never been a fans of MMOs. I liked the first GW, although I stopped playing it because everyone else who was playing it with me left for WoW or another MMO. And although I had tried other MMOs, none really grabbed my attention for more than 30 minutes. When GW2 was coming out, everyone was telling me how different GW2 was going to be from other MMOs and that I should play it since it wasn't going to be like WoW. So, I broke down and decided to buy it and after playing it for a few hours, I began to think to myself, "This is almost exactly like WoW..." Sure, there are a lot of differences to the trained MMO player, but for me, the combat is still push a button, wait for the result, push another button, and keep spamming buttons until the target is dead. I did have some fun in the RvR combat, but I found the whole questing portion annoying (I MUCH, MUCH preferred the instance-based questing of GW to the open-world questing of GW2). For me, part of the reason I hate MMOs so much is that the world never changes. The decisions you make don't mean anything. And while your personal quests allow you to make some moral choices, the overall world doesn't change. If I complete the quest bar for that one guy sitting out in a field somewhere, that stuff doesn't go away, it stays there... forever. I feel no sense of accomplishment, and experience for experience's sake isn't fun for me either. It also made the game feel so much more grind-ier. People are still competing over those kinds of objections, and while they respawn fast, it just makes me feel like I'm accomplishing less. I was promised a different experience by friends and the developers and in my opinion, I just got more of the same... the stuff I don't like. But, I'm a whiny little MMO-hater, so what do I know? I find it very laid back and even though it can be approached with a casual gaming session in mind, it is still extremely engaging. The events keep things fresh and the classes are very well developed and fun to experiment with. Im currently a 48 Warrior (Bow/Twin Axes) on Maguuma. My highest character is a level 8 Ash Legion Engineer. I have four different characters that I devote time to so leveling is kinda slow. I love the views that you can get. I tend to take a screenshot whenever I find one. I found the first 100 hrs of getting to level 80 to be enjoyable. After that I've been pretty bored. It's like going to a theme park and after riding all the rides maybe 2-3 times, it gets really repetitive and eventually you run out of things to do. Either i have burned out in 1 month or this game just didn't have enough since it recently launched. The end-game really isn't there, or a good chunk has been absent because of bugs (haven't been able to do bathazar, and only melandru once). I've also gotten very tired of doing grenth, lyssa, and dwayna events over and over again, to hopefully get good drops and money. But just doing the same linear events has kinda pushed me over a bit. I think guild wars 2 could really improve in adding more variables to the events, instead of the same repeatable over and over again. I find Spvp rather boring since the maps are the same cap 3 different points to win(no really just turn the map a little sideways and add sharks/trebuchet/ or npc's in corners). I really want just a 5v5 arena or something that doesn't make me PvE in a PvP setting. Right now the only end-game objective i can see is grinding my way to a legendary weapon, but it just honestly looks like a giant padded timesink (which includes grinding up 250 skill points, gift of mastery (about 525,000 karma, then i have to rng clovers which are about 2,100 karma a piece... etc. etc.). I understand it's hard, but doing events that only give 360-380 karma a piece to grind my way to 525k is just useless padding. I don't exactly know if i'm doing it right, but the end-game just really isn't there for me. Not to mention Wv3 is a giant zergfest. Edit: I will say though, either the creator of those jump puzzles is a masochist or a very sadistic person, who's hand i would love to shake.